Yes, you can force close iOS apps by double pressing the home button and sliding the app window up, but you shouldn't make a habit out of regularly doing it. Here's why. tl;dr: Constantly swiping up on all apps to force close them is a waste of time. For years, iOS has included the ability to force close an app by accessing the app switcher view. 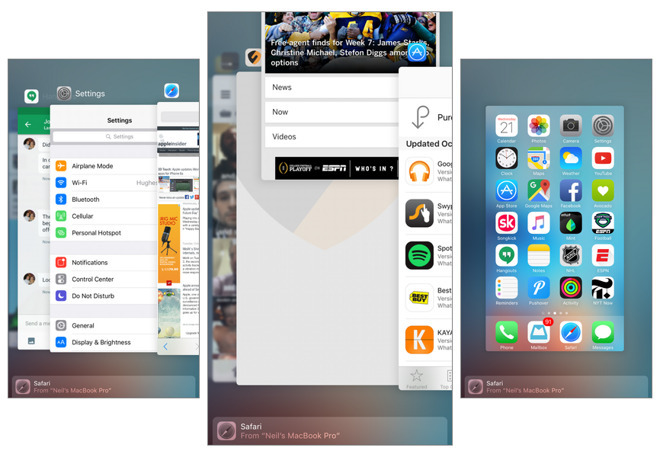 While the look and feel of multitasking has changed with different iOS updates, the basic functionality and intent have stayed the same— the app switcher is just an easy way for users to quickly jump between recently used apps. However, many users mistakenly believe that all apps shown in the app switcher are currently running in the background on their phone, draining performance and battery. That's incorrect. Apple's iOS platform does allow for intelligent multitasking, meaning some apps will operate or finish a task in the background, then automatically close. However, the iOS app switcher shows all apps that have been opened on an iPhone or iPad, regardless of whether or not they are actually running in the background. Misconceptions about the iOS app switcher have led many users to adopt the habit of double pressing the home button and swiping up on all apps, constantly, in a futile effort to improve their handset's battery life or performance. The truth is, that habit is a waste of time. For proof, restart your phone, then double-press the home button without launching anything. You'll see all of the same recent apps in the app switcher, despite the fact that iOS has been completely rebooted and nothing has been opened. The only time you should force an app to close is if it becomes unresponsive or erratic. For example, if you're using Facebook and the app has crashed, return to the home screen, then double press the home button, then swipe up on the Facebook window to force it to close. Reopening Facebook should return the app to its normal state. If you're truly worried about battery life and performance, actual effective ways of improving it include lowering your screen brightness, manually turning on the iOS 9 Low Power Mode, or digging into settings to disable Background App Refresh (under Settings, then General).